The current Silverado 1500 is a full-size truck with full-time range, shattering some truck stereotypes with its easy steering, smooth ride and quiet cabin alongside the available lightweight tailgate and ridiculously comfortable seating. For its fourth year in this form, the 2011 Silverado gains a touch in the tech department by upgrading to OnStar 9.0, featuring improved sound quality and speech recognition. Towing up to 10,700 pounds with just a bit more than a one-ton payload capacity, the Silverado is a top-notch pick for its capabilities and ably competes on everything else - save comfort. 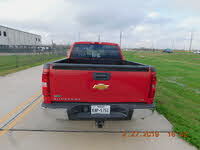 The ride is where this Silverado really shines, especially in the Crew Cab - although the base interior leaves room for improvement in addition to the elbow allotment, while other downsides include a large turning radius and lazy base V6. The lone V6 powers the baseline Work Truck by default, and it's good for 195 hp, 260 lb-ft of torque and 15 mpg city/20 highway - but the Crew-Cab-only XFE ("extra fuel economy") does better by 2 miles on the highway with its rear-wheel drive (RWD) and default 315-hp and 335-lb-ft 5.3-liter flex-fuel V8. The XFE also features fuel-minimizing modifications, including aerodynamic considerations and lightweight components like the EZ Lift tailgate, but it is the only trim without the option of four-wheel drive (4WD). The Work Truck can be upgraded to that 5.3-liter flex-fuel V8 or a 302-hp and 305-lb-ft 4.8-liter V8, which is the standard and solely available engine for the next-step trim, the LS. The second mid-level trim - LT - defaults to either the 5.3 or 4.8 depending on the body style, and at the top of the line the LTZ sports the 5.3 by default. All LT and LTZ body styles except the Extended Cab LTZ can be upgraded to the 5.3 - if the 4.8 is standard - or the 403-hp and 417-lb-ft 6.2-liter V8. A dated 4-speed automatic with floor-mounted transfer case controls the V6 and 4.8, while the 5.3 and 6.2 enjoy 6 speeds of stamina and Autotrac. As for a few basic differentiators, the road-tripping Crew Cab offers just a 5-foot-8-inch bed, but the regular or Extended Cab beds can be 6-foot-6 or 8-feet in length. 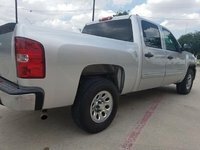 The Work Truck and LT trims are available in any body style, while the upper tier LS and LTZ trims are reserved to the Extended and Crew Cab styles. The regular-cab Work Truck is about as basic as they come - no air conditioning, but you can plug in your MP3 player with the auxiliary audio jack. Every other Work Truck does come with A/C, but moving up to the LS snags features like full power accessories, keyless entry, satellite radio and cruise control. Highlights of the LT varieties include better speakers, a convenient built-in power outlet, auto-dimming rear-view and leather touches. The LTZ comes with the expected luxuries such as alloy wheels, wood and metal accents, leather upholstery, heated front bucket seats, driver memory and a Bose audio system with 6-disc changer and convenient controls. 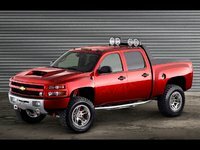 Options include several towing packages, a Z71 Off-Road package with skid plates and off-road suspension, regional packages, up to 20-inch wheels, audio system upgrades, navigation with real-time traffic updates, rear-view camera, rear entertainment system, heated power-folding outside mirrors, sunroof, power-sliding rear window, a cargo management system and rear park assist. Current drivers note that the actual fuel economy is not exactly as advertised, and with such limited in-cab cargo space, most end up getting a box for their bed. Style-conscious drivers love the look on the outside but feel the interior could use a few more thoughtful touches - even for the LTZ - but have otherwise found nothing immediately defective in the mechanicals and love the get-up in their pickup. Few makers choose the high road, most preferring instead to woo drivers with fancy gimmicks and outlandishly bold design year after year. Not so for Chevy. Drivers seeking a truck that just trucks without the bloat of other makers have long preferred the Silverado's sedate simplicity and careful, ride-focused innovation. Although Chevy has made this pickup since 1918, the Silverado name did not manifest until the '70s, and even then it was just a trim level. 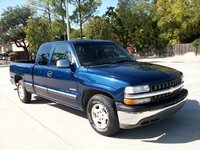 Chevy wisely chose to take baby steps, testing several platforms and configurations until it came out with a winner - and at long last, the Silverado won out over the Cheyenne and Scottsdale for '99. 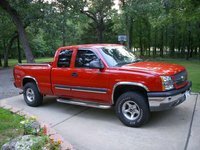 The generation leading up to that transition ran from 1988 to '98 with the Silverado known simply as either the 1500 half-ton, 2500 three-quarter-ton, or 3500 one-ton. Standard and Extended cabs were offered with a 4-speed automatic or manual transmission and many engine choices, ranging from the expectedly underpowered V6 to a diesel V8 and the popular 5-liter and 5.7-liter V8 options that often outlasted the body by far. RWD was the default and indicated by a "C" - i.e. "C1500" - while 4WD models were known by a "K" throughout the trim levels, which ranged from the base Cheyenne to the chromed-out Scottsdale and luxurious Silverado. 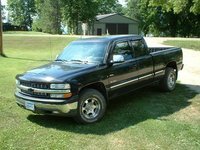 With the new Silverado 1500 name for '99 came a redesign and new powerplants, ranging from the 255-hp 4.8-liter V8 to the 345-hp 6-liter V8 offered in the Silverado SS. 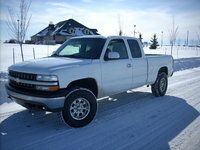 Although a V6 also made it to the lots, this light-duty Silverado was likewise lightly produced. 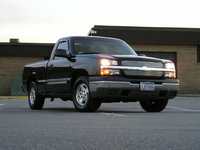 The last Silverado on a stick left the lines in '01 - a 4-speed automatic the only transmission choice for '02 and beyond. Quadrasteer became available for '03, offering a class-leading turning radius, but given the pricey and unreliable nature of the system, it was dropped for '06 - the final year of this generation. By this time the lineup very closely mimicked the current offering with regular, Extended and Crew Cabs as a base Work Truck, sporty SS or varying levels of LS and LT - but started out with just the regular and Extended cabs as either a base, LS or LT. The present generation launched with a slightly expanded lineup over the prior year - now also including the LTZ - and few changes have occurred since its 2007 debut. The 403-hp, 417-lb-ft 6.2-liter V8 arrived for '09 alongside an optional 6-speed automatic which then became standard for the 5.3- and 6.2-liter V8 engines for 2010. 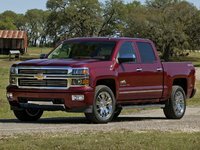 Otherwise the current Silverado has only some component tweaks to improve certain systems, like the OnStar upgrade for 2011 that improved speech recognition and audio quality. 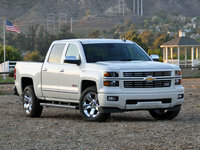 Plenty of drivers overlook the Silverado simply for its unremarkable looks and straightforward functionality, while others still snub the Silverado for its heavily checkered reliability history. The Silverado is indeed an easy scapegoat for Ford and Dodge fans to point out Chevrolet's shortcomings in the truck wars - but that is starting to change. Since 2002 the Silverado has become increasingly more reliable, with a few years of ugliness in between thanks to the problematic Quadrasteer system that ran from '03 to '05. Barring that, the best oldies are the '02, '04 and '05, with the '06 as the one sure winner. 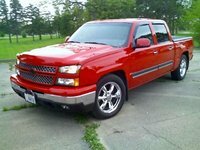 The '02 will offer the best bargains under five figures if you don't need the Crew Cab or manual transmission, but the '06 is still a steal even at twice that price for all of the improvements Chevy made to component durability. 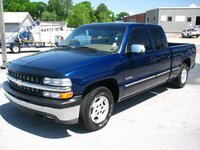 Should you prefer your Silverado on a stick, expect to pay for it - only a very lucky few land a Silverado older than the '02 without significant issues at nearly every turn. The latest generation doesn't have much for third-party reliability testing, but it does appear that the engines have been perfected with the only common problems cited being creature comforts like the cupholders, air conditioning and audio connections. The '07 is a great bargain given the minimal changes since this generation's debut, and drivers looking for more flair with their function will be pleased with the design overhaul in all but the base offering.